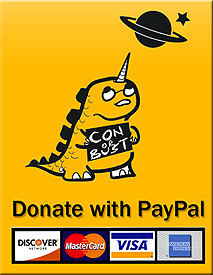 As of February 2013, Con or Bust is now located at http://con-or-bust.org/. You can find the current version of this page at http://con-or-bust.org/support/. If for some reason PayPal is absolutely impossible, please contact me to see if we can work something out. Non-monetary donations, such as convention memberships, can be made by e-mailing me (again, knepveu@steelypips.org). Directed here from Whatever. I can't attend Boskone and would like to donate my membership, if Boskone will allow it to be transferred. I'll email you.